Stimulate your brain and body by harnessing the healing power of natural trace minerals in these bath salts. Stimulate your brain and body by harnessing the healing power of natural trace minerals with these inspired bath salt sets. Found throughout the earth's vast oceans, these elements are critical to our well-being and can be absorbed through the body's largest organ, our skin. 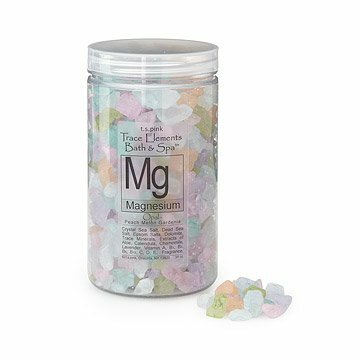 Trace Element Bath Salts combines geology, chemistry, and wellness by infusing aromatic bath salts with a single element with full-body benefits. In each elemental salt blend, fragrant essential oils, soothing aloe, and vitamins are added for a bathing experience that's good for the skin, body, and soul. Each packaged in a BPA free PET plastic jar. 38 oz each. Handmade in New York. Crystal Ocean Salts, Dead Sea Salt, Epsom Salts, Selected Trace Elements, Macro Minerals, And Electrolytes, Extracts of Organic Aloe, Organic Calendula, Organic Chamomile, Organic Lavender, Vitamins A, B1, B2, B6, B12, C, D, E, Essential Oils, Light Fragrance. How do you integrate an eclectic background in Conceptual Art, Geology, Cooking, Gardening, and a little Chemistry thrown in for good measure? It only took Todd Pink 36 years and a shower one cold February morning with just soap scraps to use for washing. After a minute, he looked down at the object in his hand and saw a rock where pieces of soap used to be. There it began. That light bulb moment and seven years of integrating herbs, oils, and wholesome ingredients changed the nature of bathing forever. Love the clever packaging! Thought this would look great on my bathroom shelf! Did not expect them to smell as good as they do! Very large container, much larger than I expected. Bath salts are a little less vividly colored than pictured online, but they are still pretty. This would make a great gift!